Bernard M. K. Nefkens, an internationally renowned scientist who served on UCLA’s faculty for 45 years and made significant research contributions in particle and nuclear physics, died Jan 10th at the age of 79. He made his home in Sherman Oaks, CA. He is survived by his wife, Helen, their three children Julie, Karla, and Chuck, and four grandchildren. The author of more than 250 scholarly publications, Professor Nefkens received many honors, including being elected as a Fellow of the American Physical Society, a corresponding member of the Royal Netherlands Academy of Science, and a member of the New York Academy of Sciences. 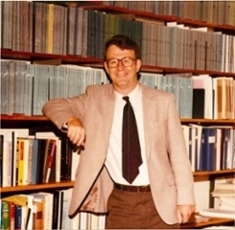 He was also a member of the European Physical Society, a Saclay Visiting Scientist during 1988-89 and 1978-79, a CERN Visiting Scientist during 1972-1973, and a recipient of a Fulbright Travel Grant during 1959. Beginning in the late 1990s, he was as a consultant and member of the CELSIUS/WASA project at the University of Uppsala, Sweden, where he also served on the Program Advisory Committee. Professor Nefkens was co-founder and co-editor of the Pion-Nucleon Newsletter, and co-founder of the International Conference on Meson and Nucleon Physics (MENU). His research interests included a diverse array of topics in experimental nuclear physics, and he was an organizer and member of program committees of over eighteen international conferences and workshops. Professor Nefkens taught at all levels, in lower and upper division undergraduate as well as in graduate classes. He had a strong interest in improving the lower division physics laboratories. He was responsible for the creation of the new sophomore laboratory, Physics 18. This has been a very popular laboratory course because it uses ingenious methods to measure properties of everyday objects around the UCLA Physics Department, such as the popular inverted fountain next door (determining its size and capacity) and of the elevators in Knudsen Hall (their acceleration up and down) , rather than using textbook measurements of springs, etc. which may sometimes seem rather dull to the students. The graduate students that he mentored are recognized for their rigorous training in fundamentals. As a teacher he had an infectious enthusiasm and a caring empathy for his students. Professor Nefkens’ research was funded by the U.S. Department of Energy beginning in 1966 up to the time of his retirement, with grants reaching up to $1.2M for each of the most recent three-year periods. He supervised many excellent graduate students during his career. Recent PhDs have found research and academic positions in such places as the University of Chicago, Texas A&M, Fermilab, BNL, and RPI. His students were encouraged to spend time abroad and to be involved in the research programs of Professor Nefkens at Bonn, Saclay, Mainz and St. Petersburg. His research involved the structure of the nucleon, and probing the Standard Model via tests of broken symmetries such as P, C, T, and CP. Throughout the 1980s this work was carried out in large part at the Los Alamos National Laboratory, where he led a collaboration of several universities in a series of experiments that resulted in a complete measurement of the pion-nucleon scattering process to high precision. In a second experimental study at LANL he produced the most complete study to date on time-reversal invariance in pion-3-body nucleus system. At TRIUMF in Vancouver, Canada, he was responsible for a unique set of neutron detectors that were used to study charge-symmetric reactions around the Delta resonance. At Saclay in Paris, France, his research group studied decay modes of the eta meson, and at ELSA in Bonn, Germany he worked on the photoproduction of the eta near threshold. One of his greatest achievements was the acquisition of the famous Crystal Ball multiphoton detector, used at SLAC and HERA, which he took to Brookhaven National Laboratory to use at the AGS. There, he founded and led an international collaboration of over 30 faculty and students at twelve institutions to carry out a program of pion-nucleon and kaon-nucleon scattering. In 2002 the Crystal Ball detector was moved to the MAMI facility in Mainz, Germany, where he formed a new collaboration consisting of over 50 faculty and students at 17 institutions, for a photoproduction program that continues to this day.